Modeled after Dusty’s hometown of Propwash Junction. 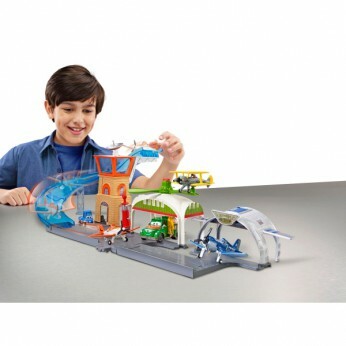 Features: Bring plane in for landing down the translucent slide, gas pump at Chug’s Fueling Station,Universal Connector comes into play clip on and fly around PWJ, and Skipper’s Shed. Comes with exclusive Dusty in original Cropdusting deco. This toy costs approximately £19.99 (for the latest and best prices make sure you check our retailer list for the Cars Planes Propwash Junction Airport Playset above). In our review of Cars Planes Propwash Junction Airport Playset we classed it as being suitable for ages 3 years, 4 years, 5 years but recommend you check the manufacturer specific advice before purchasing.